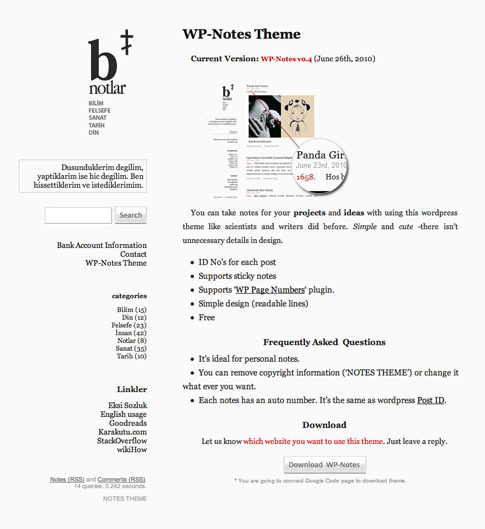 A very simple niche theme with a very specific purpose — WP-Notes was developed for you to take notes on projects and ides using this simple WordPress theme. Much like scientists and writers have done for centuries, WP-Notes free WordPress theme is stripped of all the distractions and eye-candy, which leaves you with a refreshingly clean slate for you to fill with your thoughts. So get rid of the unnecessary details today and give WP-Notes WordPress theme a try at the end of the post! Come back and check out the showcase as we find more sites from around the web using WP-Notes.